The statement confirms the story as regards the closure of the eleven UK branches of Best Buy and says, as we guessed yesterday, that the closure will be completed by the "end of the year." Charles Dunstone, CEO, said that eight of the normal Carphone Warehouse shops per week will now be converted to the new Wireless World concept. These will sell mobiles and tablets - not kettles, and you won't need to trek to a "big box" store to get them. 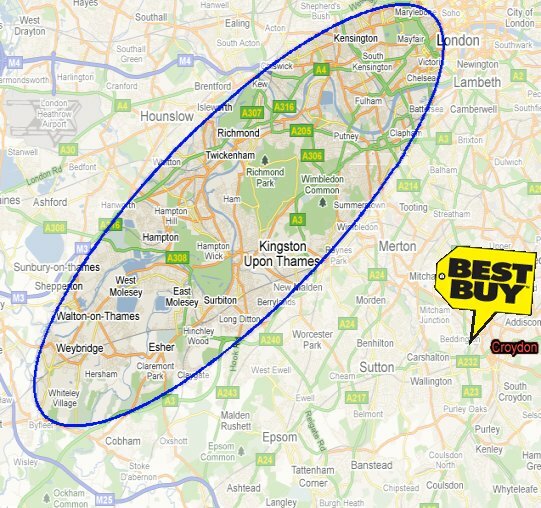 Some of the Best Buy staff will be redeployed to the new shops. So good news then? You would think so: better marketing and product focus; fewer redundancies. But the Carphone Warehouse shares have "tanked" - underperformed the market by a wapping 9% since the announcement this morning. the revelation that the partners in the joint venture have invested £200m over the couple of years it has been running. (That's £18m per store, or £200,000 per employee.) Eye watering, but not much different from what we already knew. Cynics might suggest that that city analyst types prefer straightforward redundancies to "redeployment". There is also the fine print of the deal struck yesterday by Carphone Warehouse to sell out of the American part of their joint venture with Best Buy (which has been much more successful).